This post was originally published in part on BikePortland.org This year’s PARK(ing) Day has come and gone, but to those who had a hand in the event or just took advantage of the day-long parklet on SW Stark, it was a happy memory and an example of what a public space can truly be in Portland. It was a day filled with friendly conversations, strangers uniting over a game of ping-pong, and citizens enjoying a place to work or eat their lunch. For me, I consider it a great accomplishment, and passing the street today seems bleak by comparison. But what made this day so unique? Portland has parks and plazas, public spaces that have seating options and other forms of programming. But our city doesn’t have small parks like those cropping up in cities everywhere. The location we chose is one of these places in the city that could use a chair-filled public space. The food carts are nearby, but no seating area exists aside from O’Bryant Park - a space with design issues and a lack of movable chairs. 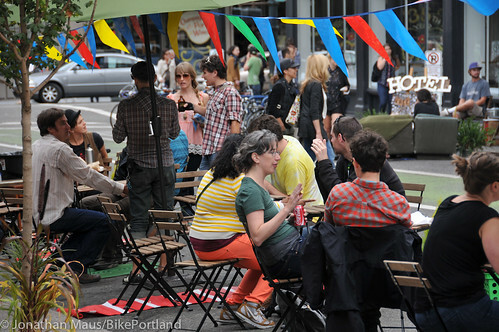 Portland has a 'street seats' program, which can also be used for these types of parklets, much like the program in San Francisco that came about from the original PARK(ing) Day experiment. As of now, the program has only produced private seating areas for restaurants - an excellent solution to “sidewalk creep” to be sure, but not a public space. It's also very unfortunate that the City caved to the Portland Business Alliance and decided to not allow any street seats in the main urban core. But that shouldn't stop us from moving forward! Before plotting a course for future action, I wanted find out what Portlanders really think. First and foremost I’m a researcher - when not working on reports at a local research firm, I’m conducting mini ethnographic observations at public spaces and blogging about the results. I had done intercept surveys before, and I immediately recognized that this would be a great opportunity to gauge opinions of a public space like this based on not only a hypothetical drawing, but a real life example. So what do Portlanders want? If the survey has anything to do with the answer, they want more public spaces! In all, we got an astounding 142 completed surveys (only two people turned me down - you know who you are!) providing a wealth of data and many insightful comments. The vast majority of respondents had been to the neighborhood before and thought that it had improved with the PARK(ing) Day use of space. They loved the increase in people, street furniture, fewer cars and safer speeds, increased bike infrastructure, and general sense of community. They also wanted to see more of things like this and thought that the city should take more parking spaces downtown and turn them into public spaces rather than increase parking spaces downtown. Respondents from out of town were inspired, wished they had it where they lived, or even mentioned liking Portland more because of it. Read the entire report here (PDF). Whether by looking at the survey or simply witnessing the event itself, what that day showed was that by a simple intervention of movable chairs, a bit of programming (ping pong), and community support, a lively place can be created. What’s more, these interventions, or even permanent places, can be created fairly inexpensively and are wanted in our city. These kinds of temporary interventions can provide a tangible example of what our cities can be like and also give real time feedback in an effort to make them permanent improvements to our city. And we’d like to do more. This project was downtown, but there are so many other places in the city that can use this kind of improvement, these projects have unlimited potential. In other places, organizations exist that do these sorts of projects. One such open-source organization, Better Block, has successfully helped create better streets across the U.S. I'm happy to be a part of making the Portland version and keep the conversation going. Please visit our website http://betterblockpdx.wordpress.com and if you're in Portland - we'd love to hear from you! Send us an email: betterblockpdx [at] gmail.com. Stay tuned for more updates!